UPDATE: I am well into her deconstruction today – Saturday, Nov 7, and just found her hull number: 22-53-308. She is a 1953 Model 110S, which makes her among the first of the first dual-quad, Hemi-331-powered Shepherd Sportsman. Wow! Selling the 1952 18’ Chris-Craft Riviera, the most original boat ever to come through our shop, was beyond painful. Shirley, my wife of 47 years, and I would finally own a boat we could enjoy as ours. But it was not to be, as has been chronicled in earlier videos. Why? Well, if you peruse the “Our Story” tab on snakemountainboatworks.com, you will learn that, what was then no more than a semi-pipe dream of growing a wood boat restoration shop that delivers at only the highest standards of craftsmanship, was launched with the purchase of a disheveled 1949 Shepherd 22’ utility in Meredith, NH. Yes, we restored that boat, but someone wanted her more and she now spends her summers on Lake Winnipesauke’s Winter Harbor. Then came the ’52 RIV. Perfect in every way and only cosmetically compromised. Once again, but this time driven in large part by an opportunity peeking over the horizon, someone wanted her more than us, and she is now luxuriating in Ohio, from which she will migrate to South Carolina in the spring. Finally! A dear friend and fellow Shepherd boat addict pinged me from Virginia, “Michael, there is a largely original ’54, 22’, hemi-powered Sportsman available, but she is lying in Pointe au Basil, Ontario, Canada.” A quick Google exercise told me that we were close to 600 miles apart. No matter. I sold the RIV without being sure I could buy the Shepherd, but things happen for a reason. One week I made a fast overnight out and back trip to deliver the RIV. 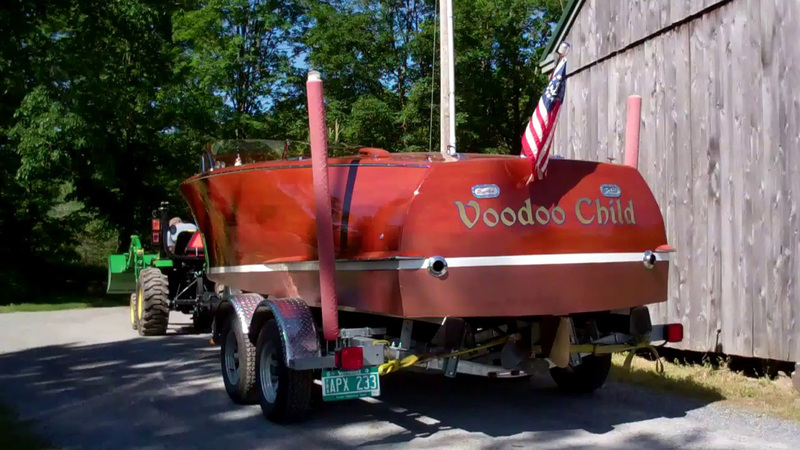 Just two days ago, towing my new Sea Lion, a custom-made trailer purchased from and delivered by my go-to source of boat trailers, Trailer Outlet in Tilton, NH, I was on the road again. At 10:00 last night, after driving over 1,200 miles in two days and loading my “new” Shepherd, we arrived home. Taking a longer northern route through Ottawa back meant escaping most of the fury that the remnants of Hurricane Patricia visited on southern Ontario. Yes, she does have an issue or two, but is just so complete and so correct. Reflecting his about 6’6” height, Tim Simmonds, who agreed to pass her stewardship to me, had the helm seat lowered. At 6’3”, I can deal with returning it to its proper height. The original gas tank, which we have, is beyond saving, and has been replaced with a plastic tank and “modern” filler spout. Fortunately, Tim had the folks at Desmasdons Boatworks in Pointe au Baril saved the original mounting brackets, filler spout, which will allow us to get very nearly back to original on this score. The background of the gauge panel has been machined turned chrome on every Shepherd we have worked on to date, and this one is matte black. We will do some research here. Bottom line: Do not ask. She is not for sale, will not be for sale. Period.